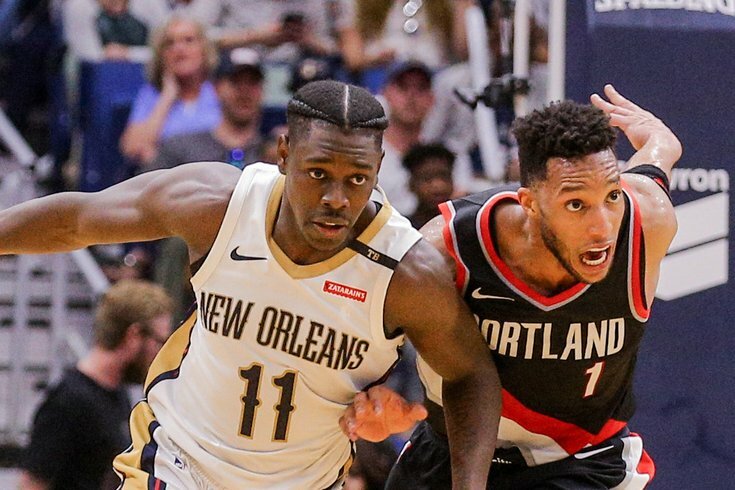 Jrue Holiday and Evan Turner, vying for a basketball in their post-Sixers lives. Before Sam Hinkie was hired in 2013, the Sixers were an odd team. They weren’t bad — they reached the playoffs in 2011 and 2012 — but they weren’t going anywhere. They hadn’t won 60 percent of their games since the 2000-01 season, and they had no clear-cut stars. So Hinkie blew it up and began The Process, which was a success: The Sixers currently have the best young core in the league and are on pace to win about 105 games in two seasons. They should secure a second straight top-three seed in the Eastern Conference playoffs this spring. Sixers mailbag: How does JJ Redick fit into Philadelphia's long-term plan? The team Hinkie blew up, though, sees it differently, according to a new ESPN story about former Sixers point guard Jrue Holiday. "I see Philly fans all the time who say, 'Man, they never should have broken up that team!’" Holiday says. "I'm like, ‘You are preaching to the choir!'" “Apparently we weren't that good," smirks Iguodala, the first to go in the 2012 Dwight Howard/Andrew Bynum mega-trade. "Because they got rid of us all." It certainly is interesting to see where each of those players has ended up: Holiday is very good, Iguodala is very good, Williams is a basketball player, Turner exists, Young is a basketball player, and Vucevic is the top scorer on a weird and bad team. They wouldn’t be an awful team in 2019, but to pretend Hinkie blew up some sort of contender, in an Eastern Conference era dominated by LeBron James, feels silly. For what it’s worth, the story itself is extremely good. It talks Holiday’s work ethic, his growth, and even the relationship between Holiday and former Sixer Evan Turner at length.